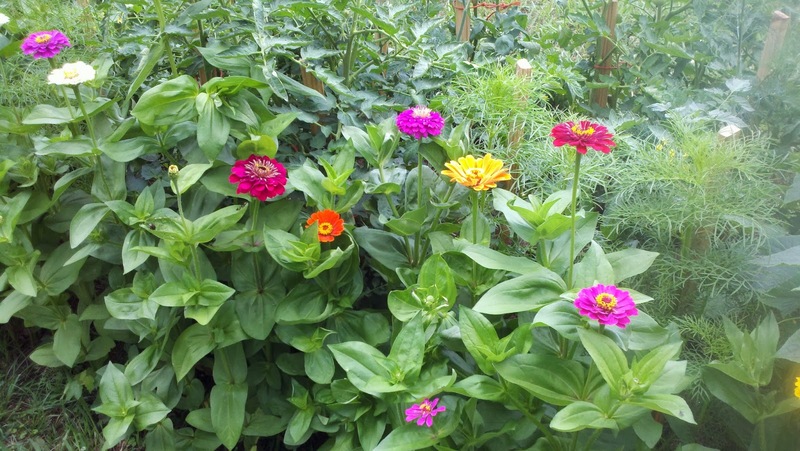 I spent some time trying to companion plant flowers and herbs into the vegetable garden this year. Some of the herbs have been highlighted in previous posts, but here are two of my favorite flower varieties. First is bachelor's button. I'm loving having the silvery foliage and bright flowers tucked into a corner. My absolute favorite are Zinnia. There is an amazing variety of colors and heights. I made the mistake of planting the first I found, which ended up being a tall (4') variety. It looks a little silly have these towering flowers next to 2' tall vegetable plants. However, they make beautiful cut flowers, and if you keep dead-heading the blossoms (cut off the head when the petals fall off) they bloom from spring to winter. They've been hit by some powdery mildew next to the squash, but they continue to perform great. In the background you can see some young Cosmos (the fearny green leaves). This are ok, but they look too much like weeds to fit into a vegetable garden. Plus they get to be 5-6' tall and don't really bloom until August.